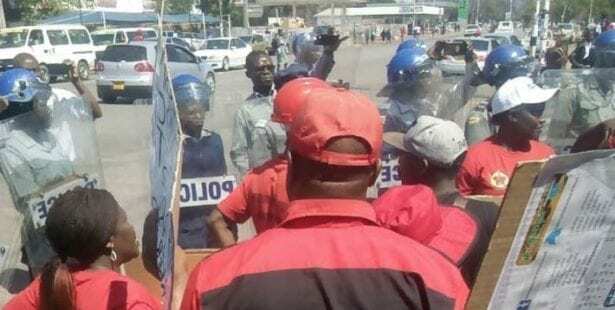 Zimbabwe Congress of Trade Unions (ZCTU) President Peter Mutasa and Secretary General Japhet Moyo, along with 33 other trade unionists who were arrested, and some beaten Thursday, were released from jail Saturday. The violent action by police was designed to prevent a national workers’ protest against rising prices and a financial tax increase. Some 150 police cordoned off the Harare offices of the ZCTU. Senior leadership of the ZCTU not already in jail were forced into hiding. “This is unacceptable. It violates the foundations of democratic societies: freedom of association, assembly and speech. The global labor movement and anyone who cares about worker and human rights are rightly outraged,” said Solidarity Center Africa Regional Program Director Hanad Mohamud. ZCTU was preparing to lead a national demonstration to protest a new transaction tax as well as rising prices and shortages of basic goods and fuel. Workers say the new tax would further hurt the country’s already impoverished citizens. The AFL-CIO, International Trade Union Confederation (ITUC), Southern African Trade Union Coordination Council (SATUUC) and ZCTU condemned the attack. “It is saddening that once again the workers of Zimbabwe have been denied the right to organize, assemble and freely express themselves barely two months after the swearing in President Emerson Mnangagwa, who proclaimed a new dispensation for the people of Zimbabwe and promised transformation from the previous President Robert Mugabe brutal administration which repeatedly violated workers’ rights with impunity,” said SATUUC in its statement. The arrested leaders have been ordered to appear in court October 30.